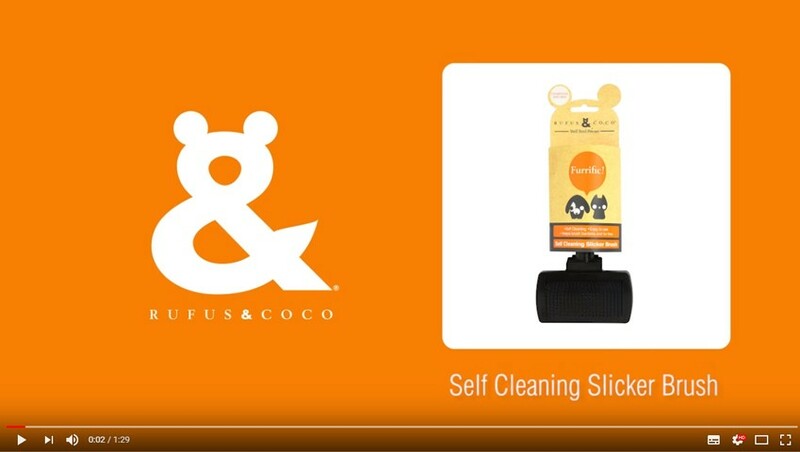 The award winning Self-Cleaning Slicker Brush has an easy to use push button slide that helps to lift the fur from the brush for easy cleaning. This clever little brush also has a charcoal infused head to help naturally prevent the growth of bacteria. Throw in bristles designed to gently detangle and leave a smooth, glossy finish without irritating your little mate, and you have the (we think) perfect brush! What more could you ask for? How to look like new again: Start by brushing your little mate in the direction of your pet's fur first to remove debris. Separate the fur by brushing from the skin out, then brush slightly against the grain of the coat to remove dead hair. To clean brush, simply press button on back and lift away fur. For best results, use with Rufus & Coco's range of furrific washes and a spritz of 4in1 Pamper Spray to smooth and detangle. My coat had gone to the dogs! But not anymore with my Rufus & Coco Self Cleaning Slicker Brush. It's so simple to use - it cleans itself, keeping my coat bacteria and extra fur free!